Located a few kilometres away from Manciano, in the heart of the Maremma in Tuscany, the Terme di Saturnia Spa & Golf Resort is a natural paradise for lovers of well-placed in perfect harmony with its surroundings. 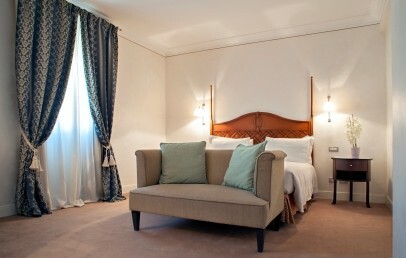 The hotel is at about 170 km from Rome, 200 Km from Florence and 450 Km from Milan. Obtained from the modernization of an ancient building of travertine, the hotel is included in the spectacular scenery of the natural waterfalls that flow to 500 litres per second at a temperature of 37°. The spa complex of Terme di Saturnia, located in the village of the same name, has gone beyond national boundaries, differentiating itself for the high quality and the elegance of its services. Le Resort Terme di Saturnia offers altogether 140 rooms, divided into different categories: Comfort, De Luxe, Executive, Grand Suite and Superior, an all designed according to the "philosophy's habitat", in complete harmony with its natural and architectural surroundings. They are equipped with all comforts: air conditioning, mini-bar, telephone, TV, satellite, safe and pay TV. Undoubtedly worthy of note are the 2 Grand Suite of 75 sqm, consisting of bedroom, living room with dining room and two bathrooms in marble and travertine; excellent design and refinement. The hotel has one of the largest and awarded Spa of the world that focuses on the well-being and psycho-physical regeneration of their guests. It offers 54 treatment rooms, where the atmosphere can be customized with your favorite music and favorite fragrance. The sulfur-containing spring water has "antiageing" properties and combined with the latest equipment and methods they achieved brilliant results. Furthermore, it offers a wide range of beauty treatments, combined with the benefit of the properties of the water, to tighten the skin and to combat blemishes. The access to the thermae is included in the price. The two restaurants “Aqualuce” and “All'Acquacotta” will satisfy the most demanding palates: the restaurant “Aqualuce” offers a cuisine strongly linked to regional tradition, with authentic dishes and strong flavours whereas the restaurant All'acquacotta proposes tasty but light dishes, in line with the philosophy of wellness that combines the pleasure of eating to the attention to healthy foods, thanks to the careful selection of seasonal products. For those who wish, a medical expert staff will give you advice and a special dietetic menu studied on purpose. Golf enthusiasts will be certainly happy to be able to train in a 18-hole championship golf course adjacent to the resort; there is also a fitness centre, to restore balance thanks to healthful paths that are divided into pools and spa treatments, gym and walking in the secular park. After the treatment of the body, nothing is better than visiting an art gallery and the boutique Terme di Saturnia. Tourist tax – from 1 March to 31 October the payment of 3,00 Euros per person per overnight are due for all people after 14 years. Cozy and warm double bedroom, located in the oldest part of the Villa furnished with a particular care and with all the comfort. 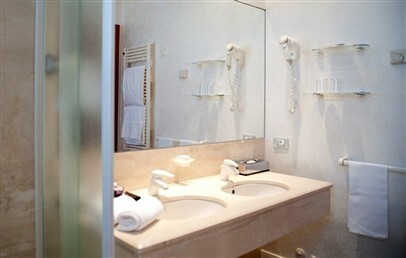 The bathroom has a shower or bathtub, hairdryer and pool kit with bathrobe, slippers and bag. The Comfort rooms are situated on different floors and have different views toward the park or the green hills in the surrounding. Elegant double bedroom with a walk-in closet and a living room that can be connected to another room (on request). Furnished with exquisite taste, all different from each other with carpet or parquet floor. 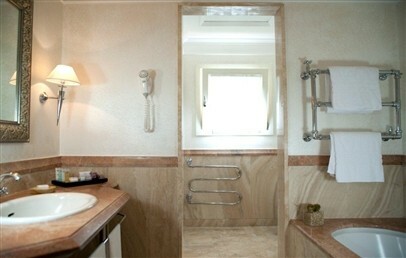 The bathroom, in travertine marble, has a shower, a separate bathtub, hairdryer, VIP amenities and a pool kit that includes a bag with bathrobe, towel and slippers. Some Executive rooms have a small courtyard with a private garden whereas others are equipped with a lovely balcony overlooking the park or the thermal spring. 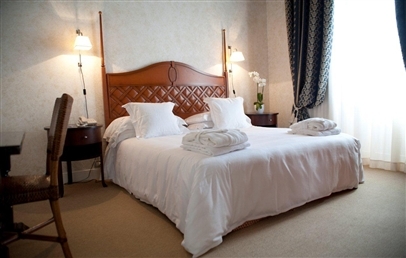 Spacious double bedroom decorated with soft colours in a sober and elegant style. The bathroom has a shower or a bathtub, a hairdryer and a pool kit that includes a bag, bathrobe, towel and slippers. 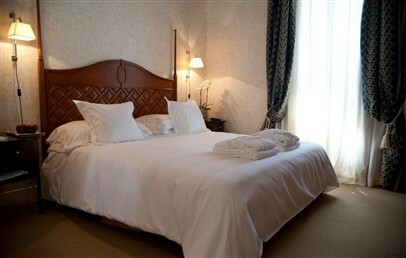 The Superior rooms have a wonderful view over the thermal spring or over the pinewood. 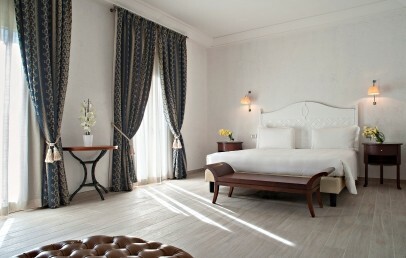 Elegance and design are the main line in the Suite furnished with a particular attention to the details. It has a bedroom with two walk-in closets and a separate living room with dining area. It offers two bathrooms lined in travertine marble, one with shower and the other with bathtub, hairdryer, VIP amenities and pool kit that includes a bag, bathrobe, towel and slippers. 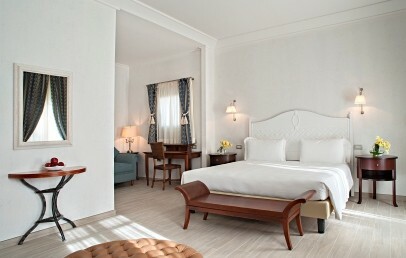 The Grand Suite offers a panoramic view on the spring and the countryside. Large double bedroom with walk-in closet and living area, that can be connected, on request, with another De Luxe. 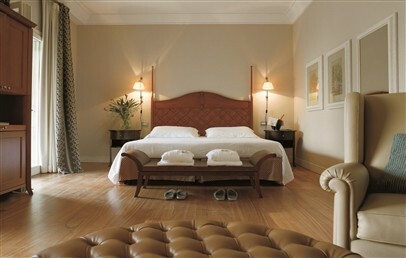 They are furnished in an elegant style and have either a carpet or parquet floor. The bathroom lined in travertine marble has a shower and a separate bathtub, hairdryer, pool kit that includes a bag, bathrobe, towel and slippers. Some De Luxe rooms have a small garden in the courtyard and all rooms have a wonderful view on the hills.